A fall in the value of the South African Rand and a relaxation of visa regulations saw foreign visitor numbers soar at the start of 2016, according to a report by Pricewaterhouse Coopers (PwC). 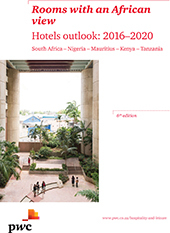 The PwC report, Rooms with an African View, Hotels Outlook: 2016-2020, focused on four other key African nations – Nigeria, Mauritius, Kenya and Tanzania – to offer a largely positive view for the growth of the hotel and hospitality market. The number of hotel rooms planned is higher than previous years and continues to increase, says the report. Room revenue in the five countries rose 6.7% in 2015, the largest gain since 2011. Tanzania – a country heavily dependent on tourism and included in the PwC report for the first time – had the largest increase with a 14.4% gain thanks to increased room rates, which offset a slight fall in nights stayed. The report said Nigeria’s hotel sector’s “long-term prospects remain positive, though the impact of its current weaker economy is likely to reflect in near-term hotel performance”. Kenya remains one of the stars of the continent where “economic growth has been strong and a number of incentives have contributed to a recent increase in tourist and business arrivals.” Occupancy rates in Nairobi and Mombasa remain high and the average room rate is on track for another healthy gain in 2016. Mauritius hotels rely largely on foreign tourism but, said the report, “in contrast to Tanzania, it experienced an increase in stay unit nights in 2015, but a drop in the average room rate that resulted in an overall 6.7% increase in room revenue”. South Africa had experienced a decline in foreign tourism in 2015, but an increase in domestic travel led to a small gain in stay unit nights and an 8.1% increase in room revenue as the average room rate increased. The first quester of 2016 saw an increase and tourism contributes 9% to the nation’s GDP. The 60-page report offers in depth analysis of year on year changes in all five African nations. Pietro Calicchio is PwC’s Director responsible for the report said that each country was affected differently by global and local economic forces with varying reliance upon tourism. He said: “It is also promising to see a growing number of new hotels planned for the South African market over the next five years. We are forecasting an additional 2,600 hotel rooms to be added over this period. “The hotel market in Nigeria has not fared as well as South Africa with stay unit nights dropping 12% and room revenue down by 3.6% over the past two years. Hotel room revenue in Mauritius increased by 6.7% in 2015 and is projected to grow at 10.6% compounded annually to 2020.